Us lovers of Italy understand the attraction of the language, the draw the smell of a fresh baked brioche has on our hearts, how the clinking of cups nearby catches our attention because we know there is un buon caffe that awaits us in the next store front or around the corner or around the corner or around the corner. These are simple things that make living in Italy a daily adventure, in fact, you might even call them a daily pleasure despite the fact we are well aware jobs are limited, the political system is corrupt and you will never get through the line at the post office as quickly as you may have imagined. The other day I was chatting on the phone with another Italophile realizing that we both expressed and shared these same feelings towards Italy. We among all understand well the idiosyncrasies of Italian society and the bureaucratic headlock you can so easily find yourself in, nevertheless we love Italy the same, if not more. I found so much comfort in the fact that I wasn't alone in thinking these odd almost trivial pieces of life were more than just pieces of life, but adventure and lust. We discussed how we were fortunate to spend time in Italy, to want the thrill of living abroad and to enjoy living in a daily adventure.Italy is just that, an adventure. My most traveled adventure in Bologna was my walk to and from my apartment to my school, the department of political science in Strada Maggiore, 45. One might characterize this daily walk as a commute, but for me it was an experience every time I stepped out my front door on to Via Solferino and headed East towards Strada Maggiore. But let's start even before I stepped out of my house. My general morning routine consisted of making coffee and having breakfast in my apartment kitchen. The adventure began there, every morning, at my kitchen table. Looking south out of my kitchen window, I had a perfectly framed view of the church San Michele in Bosco, sitting humbly on top of the hill. It was such a treat, and I soaked up that view as often as I could. 1. San Michele in Bosco: Like I previously mentioned, the sight of a the sunrise (or a sunset), a set of fluffly clouds, a clear blue sky or a foggy Bologna morning encompassing the church on top of the hill framed perfectly by my kitchen window was my favorite sight and adventure every day. The magnificent view often stole my attention, comforted me every day I lived in Via Solferino and often made me a few seconds slower out of the house. 3. 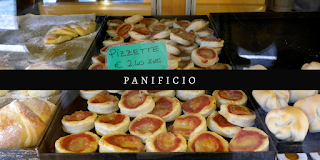 Piadineria Vecchio Mulino: As many of you know, Piadine are a staple to life in Bologna. This Piadineria sat at the corner of Via Castellata and Via Rialto, right at the point so you could never miss it, especially walking home from Strada Maggiore. There was always a crowd here at lunch, hanging in the streets, hudled over their neatly wrapped piadine or tortelloni ripieno con nutella. I enjoyed stopping here for a yummy crescente or their special nutella stuffed tortelloni.... yes, I am a golosa! 4. Calzolaio: One day I realized my boots needed some new soles and I realized, hm! Don't I walk past a cazolaio everyday on the corner of Santo Stefano? Yes! You can't miss the tools hanging in the window and the shoe molds dangling from every corner, and of course... the smell of leather! I loved peaking in this window to see what shoes the Calzolaio might be banging on, so fun! 5. Cinema Rialto: There is a small movie theatre located on Via Rialto, the back of which faces Via Castellata (my daily route). I always enjoyed walking down the road behind the cinema and listening to see if I could hear the movie playing within. It's something I liked to listen for, but I have to say that I never went to see a movie there, and I probably should have. 6. Shoe Store: It's crazy but I can't remember the exact name of the store, only the exact location, smell and beautiful shoe display remain in my memory. It was a sort of outlet of hand made leather shoes and I was never lucky enough to find the perfect pair for me, but many a pair of men's shoes I brought home for my brother and boyfriend. I loved slowing my walk to browse the windows lined with beautiful leather shoes, men's and women's, on SALE! 8. 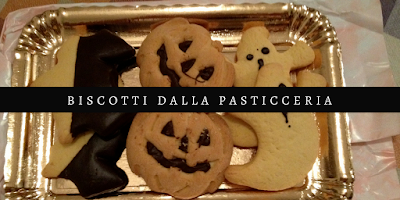 Caffe dell'Academia: My bar! From the owner who wore split apart glasses colored with the Italian flag, to the thoughts for Lucio Dalla notebook seated outside, this was my go to bar and study place on the way to and from Strada Maggiore. The water bowl for dogs outside, the poem and limerick of the day, the cappuccinos, the pastries and the lunch choice are among my favorite things Caffe dell'Accademia had to offer. I would often meet my friend Lina here before class where I'd take a cappuccino and she'd have a ginseng she claimed to be among the best in town. My only regret is that I didn't talk to the barista often enough, I should've been more outgoing! ese, wine, pasta, bread, biscotti and salumi vendors would catch my eye and turn my attention towards what I might stop to by and cook on my way back from class. 10. 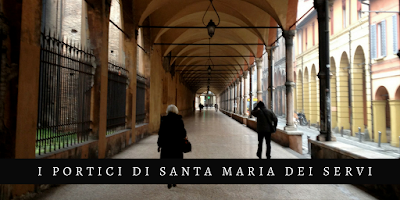 Santa Maria dei Servi: This is one of my favorite churches in all of Bologna, notable because I pass it to and from school, but also because the front of the the church opens into a lovely brick lined courtyard enclosed by beautiful rows of porticoed walkways. The portico spanned nearly the whole block leading up to the political sciences department and framed the beautiful facade of the church. Along the left flanking wall you could always peer into the side door of the church at the beautiful decorations and see the madonna on the wall protected by the portico. Not to mention the beautiful terracotta color that brightens the day! 11. FRAM Cafe: This cafe was a late find in my two years of walking to Strada Maggiore, but once found, I couldn't stay away! Fun decorations inside, as well as a fun menu boasting fresh fruit smoothie like drinks and other healthy non traditional snacks. 12. Graffiti: A small pink graffitied area on the orange wall in Via Castellata always caught my attention and made me smirk. The graffiti wasn't originally there when I first began school in 2012, but I noticed the new graffiti during my second year at Uni: "Peace, love, and drugs"
13. 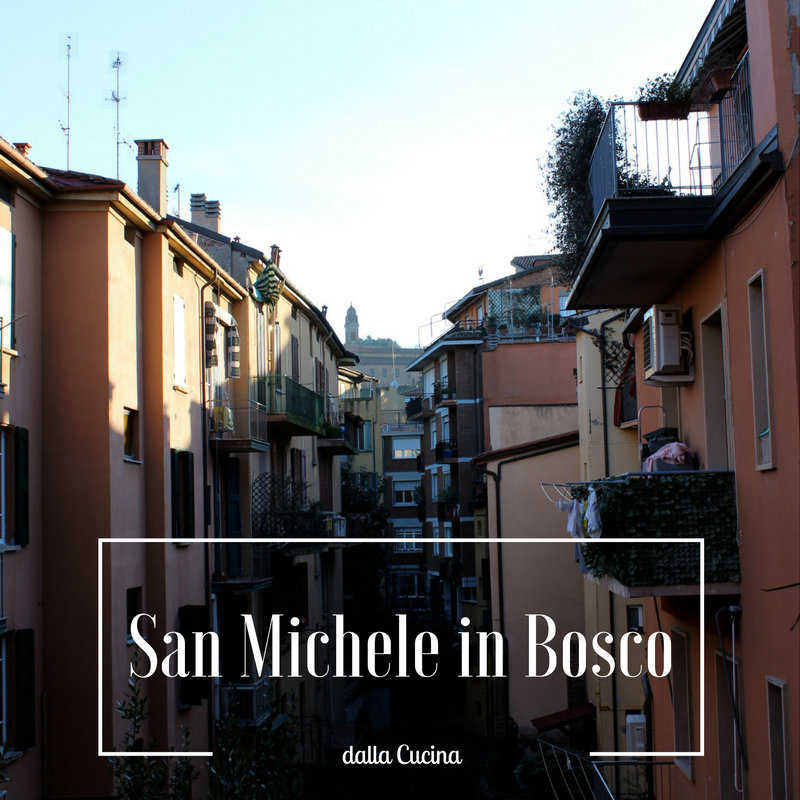 Doors and Moldings: This is all of Bologna, not just my walk! But these certainly made me smile along the way to school, one door in particular won't ever escape my memory, the tiny wood door against the bright orange painted wall in Via Castellata. Moldings above the continuous porticos, barred windows and details that you just don't find in every city. 14. Cars: My favorite blue FIAT 500 L lives in a gated area outside an office space in Via Castellata. I fell in love with it the first time I walked by and wish it was parked there everyday. 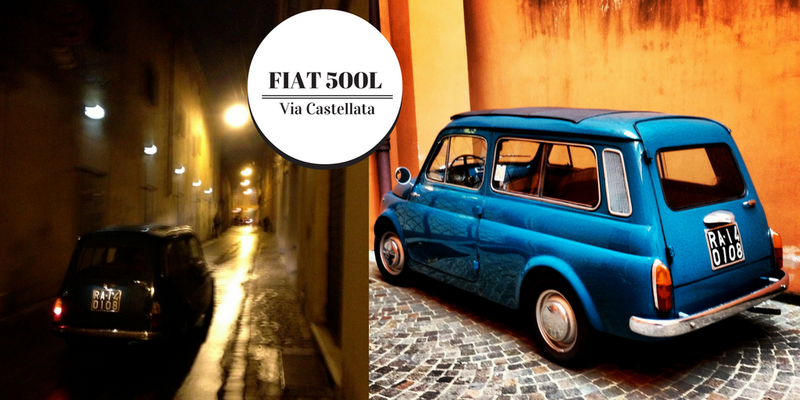 FIAT EPOCA = LOVE & HAPPINESS. 15. Avoid the dog poop! Evitare la cacca del cane! Not my favorite surprise on the way to school. Rule of the Bolognese roads... watch where you step! More than once I've been a victim of dog owners not picking up after their dogs. 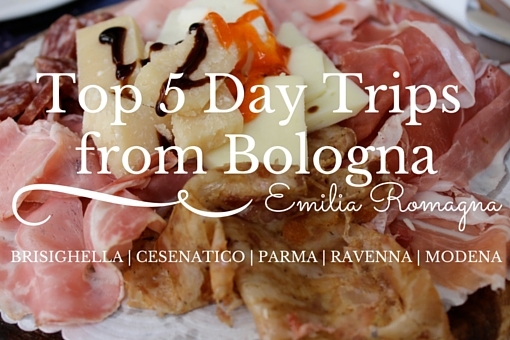 A top 15 list every Bologna visitor must read!